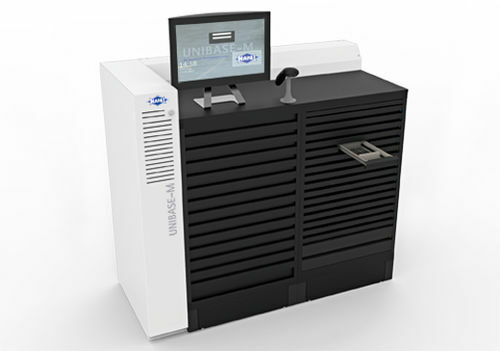 The new UNIBASE-M automatic tool dispensing system stands for optimum storage and management of tools, components and accessories and offers numerous innovative and user-friendly features. UNIBASE-M is designed as a modular system for the management and dispensing of tools, which ensures quick, efficient and controlled tool availability. Starting from a basic module with computer unit it can be individually confi gured to suit the application. Storage is either centralised or decentralised directly at the machine. Completely new is the intuitive software with extended functions which ensures quick, effi cient and controlled tool availability. For example, a control logic gives the user an indicated of the selected drawer. Machine standstills due to a lack of tools, huge tool stocks due to excessive goods orders or double orders, as well as time and cost-intensive ordering processes can be reduced or completely eliminated with UNIBASE-M. UNIBASE-M can be easily integrated into external ERP systems on and in existing operating facilities.